Related Article: Capital One Secured Credit Card Review – Credit Diary Part II. After 10 years of using credit irresponsibly, I have finally decided to do something about it. The two credit cards I had were closed about a year ago by the issuing banks, and since then I haven’t even been able to get approved for an Old Navy store card. Now that I’m married with kids, have a degree and a job, I have come to the realization that I have no chance of getting approved for a mortgage loan. To make things worse, being self-employed makes qualifying for a home loan much harder. Ruining my credit was a combination of being a struggling college student, and not being well informed about the repercussions of mishandling a credit card (not paying or paying late, going over my limit, etc.). I decided to keep an online diary of my progress, so I could help other others in the same situation as well as getting some input from those who have more experience with credit. So, if you are reading this and would like to post a comment, please do so below. I am not a credit expert, nor I am interested in selling you anything. I do not work for any of the banks mentioned here. I’m just a regular person with bad credit. After doing some research, I decided to get a secured credit card to hopefully improve my credit scores. I’m also trying to clean up my credit report as much as possible by trying to remove unpaid collections (still a work-in-progress). To follow a timeline of my progress please read: “Credit Diary Part II“. I ended up applying for the Capital One Secured Master Card and I will tell you why. Let me start by saying that I was not shopping for the best credit card in the traditional sense, but I was looking for the best credit card that could hopefully get me out of trouble. The different APR’s offered by these banks differ substantially, but they are all the same to me. I’m not really interested in buying stuff with this card, I am interested in using the card for small purchases so I can pay my balance in full each month. I have done a lot of research and this is apparently what you have to do at the beginning to establish a good credit history. Later on when I my credit improves, I can shop for regular credit cards and can consider APR’s, perks, etc. Any of these three cards should work well if used properly. The Wells Fargo secured card was the first one to be erased from the list. This card requires you to have a checking account with Wells Fargo or Wachovia, and I’m not interested in another checking account. If you do have an account with them, it looks like a good card so definitely check it out. The Orchard Bank secured card looks good as well. The $35 annual fee is waived the first year and there is only a $200 Minimum Security Deposit, which seems reasonable. You do have to mail your application along with the deposit, and I would have preferred doing everything online to get things moving faster. So I decided to go with Capital One, which even though has a $29 annual fee that is not waived, you can qualify for a $200 limit with only a $49 refundable deposit. Credit Line: $200–$3,000. Minimum security deposit gets you a $200 line. Deposit more to increase your line. You’re approved – almost done! Just make a $49 refundable deposit and your card will be on its way. I understand that you can get approved and asked to pay more than $49, so I was happy with the deal. I then proceeded to make the minimum deposit plus $150 in order to get a $350 credit line (if $49 gets me a $200 credit line, adding $150 more will get me a $350 credit line). Another positive thing about this secured credit card, they give you 80 days to make the deposit, and you can make the deposit in full or over time, as longs as you make it before the date given (they’ll give you a date range once you get approved). Also, they give you free enrollment to CreditInform, which supposedly lets you track your credit score. We’ll see about that, I’m sure there’s a catch, but I’ll report on this later. – Earn credit line increases. You may earn credit line increases based on your payment and credit history. I have to say that I read lots of bad reviews about this card online and was a little nervous about the whole thing (most people complained about bad customer service and being charged extra fees?). I then spoke to a good friend who’s had a Capital One credit card for a number of years. She said has never had any issues with them and that she always pays on time. So it makes me think that I should be ok if I manage my card responsibly. To check out the progress (or lack thereof) I’ve had with the Capital One Secured Credit Card, please read: Capital One Secured Credit Card Review – Credit Diary Part II. If you want a higher line of credit, you have to “show” them you can handle it BEFORE requesting. I agree with the previous comment, treat like a debit card — charge then pay and then repeat process to the limit of your budget. if you charge and pay in excess of $30,000 annually you will definitely get their attention. If that means paying it 4 times in month — then so be it. interesting journal. for myself, i did the same thing with the $49 deposit and $200 line of credit and then expanded from there. i opened mine in dec 2011 and now sept 2012 and i have acquired a total of $450 unsecured credit with $2550 deposited brings me to $3,000 CLI. Rule #1 for me … treat it like a debit card. if you don’t have th CASH don’t buy it unless it’s an emergency like the timing chain went out on the car and you need wheels to get to work. BUT expect the unexpected and keep a seperate savings account to plan for the UNPLANNED. Rule #2 other than unplanned expenses, treat it like a debit card and wait for the deposited money to clean in the account then go shopping. NEVER ASSUME YOU ARE GETTING A PAY CHECK in this economy. then pay it 3-5 days later after all the charges have gone from pending to posted. Rule #3 … pay the account down to $50 … you need some money that the credit can post so it doesn’t look like “no” activity. Rule #4 — charge everything to it … utility bill, car insurance, wireless bill, cable bill, etc. my average “volume” is $2,000 or more. When I started, after my additional deposit, I had $500 credit limit. i paid it 4 times in one month and still sent money to increase my line of credit. now they see i don’t bounce checks or deposits so they clear quickly. ** the trick is pay before the statement is due down to $50 balance or 9% utilization or less (balance/credit limit). After encountered with a bad debt most of the credit card holders are not eligible to get another one therefore its quite better to repair the credit to enjoy the benefits of cash free shops and transactions. Well written and unbiased article. Thank you for sharing. I also have the same card with maximum credit limit they allow. I have had it for a little over a year and I will say it doesn’t help my credit like I hoped it would. I always pay it in full the same month and at least charge it once or twice a month. I waited and waited for a call or an email from them for credit limit increase but to no avail. My credit has improved substantially over the past year not because of this card but due to me paying off a lot of ‘bad’ debt. I am going to close it in January 2012 right after I get my home loan. I also recommend to shop around first before you decide to get this card. Hi Camille. Congratulations on your pregnancy! I didn’t realize as well how important credit was until I had a family. I wish I would’ve been more responsible back then. Thanks for stopping by and let me know how you do with all this credit stuff. I got my first unsecured credit card when I was in college and I feel like I was not properly educated about how to handle it. I didn’t take credit seriously and it got the best of me. Now, 6 years later, I am expecting a child and want excellent credit so I can better take care of this child’s needs. I wish there were a mandatory course in college like English 101 about credit. Perhaps Credit 101. Sadly, my bad experience had to be my teacher. Sounds like a great little tool, I’m glad to know it’s really free. Thanks again for the insight! Yeah I enrolled with Creditinform. It was kind of a process though. I had to make phone calls to Creditinform several times, and then I had to fax them some additional information about myself. It is definitely free, you just have to be persistent about getting your login. You get your credit report quarterly – so the last time I could check my credit report was in November. I think it’ll update in Feb. I may be wrong on this..but I think that’s what it is. Keep in mind that this is a FAKO report – meaning it’s a fake credit report because it pulls information from the actual bureaus (Experian is the one Creditinform says it uses). Creditinform is cool though because it has a bunch of information about your score, and helps you calculate what your score will be if you pay in time for 1 month, 3 months, a year, etc. Thanks a lot for your input. I need to post my credit score as well so I can keep a record of my progress. 666 doesn’t sound like a terrible score, last time I checked my score was a few months ago, and I think it was somewhere around 568! I need to check it again and update the article. Have you enrolled in the CreditInform offered with the card? If so, what kind of service is it and is it really free? For example do you have access to your credit score for free with it? Thanks for stopping by and please come back soon so we can compare notes! I will be updating the “timeline” as soon as I have something to update. Hi I just came across your blog as I was looking at various people’s experiences with the Capital One Secured card. 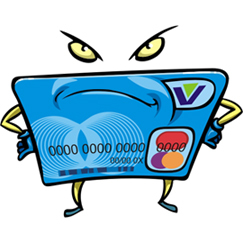 I actually have the secured card myself, as I am slowly trying to build up my credit. So far so good, as my credit score has increased from 655 median score to 666 since September of 2010. It’s not much, but now I’m taking more definitive actions to increase my score. I’ll be keeping an eye on your blog to hopefully compare notes! Hi, how long did it take to get your card in the mail.